Seaweed – You’re probably eating it without realising! 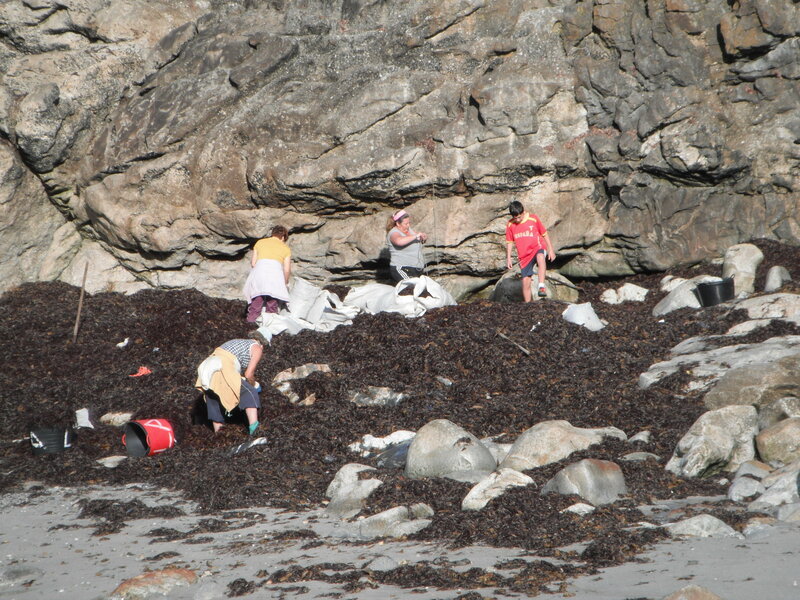 At a small beach just outside the Galician port town of A Guarda, an elderly lady wearing a vest top, blue cut-offs and a floppy, white hat is collecting seaweed from amongst the rocks and piling it into large, black, plastic buckets. She carries the buckets on her head to a small yellow trailer and, when the trailer is full, she drives off on her spluttering moped to a flat, concrete area where she lays out her crop in the sun to dry. My Spanish is very poor and she speaks no English but I attempt to ask her about the use for this seaweed. ‘Is it food?’ I mime putting it into my mouth. ‘Crema.’ She rubs some on her skin. ‘You make it?’ I point to her and then the seaweed. ‘No!’ She laughs and launches into an explanation in Spanish of which I catch only the words, factory and laboratory, and the town, Porrino. The next day I see a whole family collecting it with her. Although they seem to have separate motivations, they work happily alongside each other, chatting and joking together as well as with the other locals. I am intrigued about the destination of this seaweed and I want to know more about the product. I type the words ‘seaweed’ and ‘Porrino’ into Google and it enlightens me. CEAMSA is a company in Porrino which manufactures carrageenan and pectin products for the food industry. 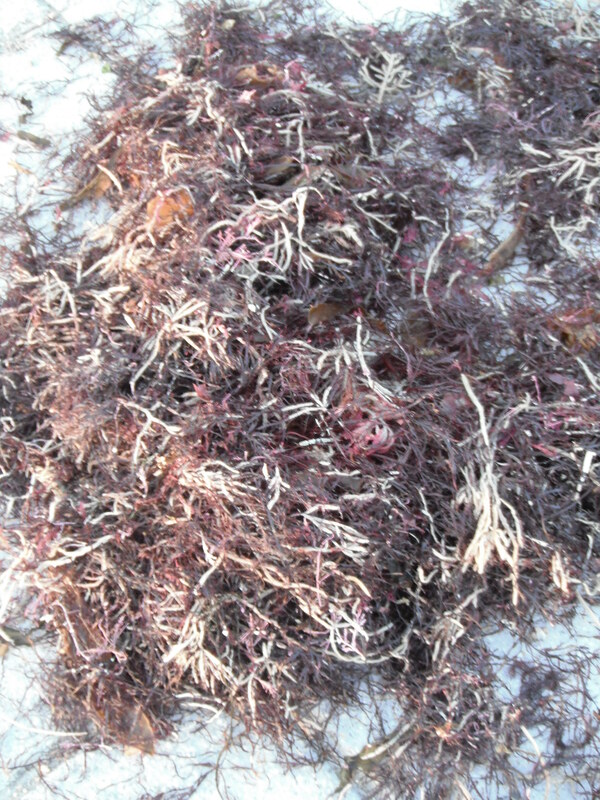 The carrageenan is a food preservative and is made from the fluffy, burgundy seaweed I have seen on the rocks. It’s present in a lot of the food that we eat, such as chocolate milk and ice cream. It is also used as a thickening agent in place of gelatin, which is an animal based product. Toothpaste and hair products may also contain it. The company additionally has a base in The Philippines and other similar companies operate out of East Africa and Indonesia. I wonder how much the people who collect the seaweed are paid in relation to how much the company makes from selling its product. 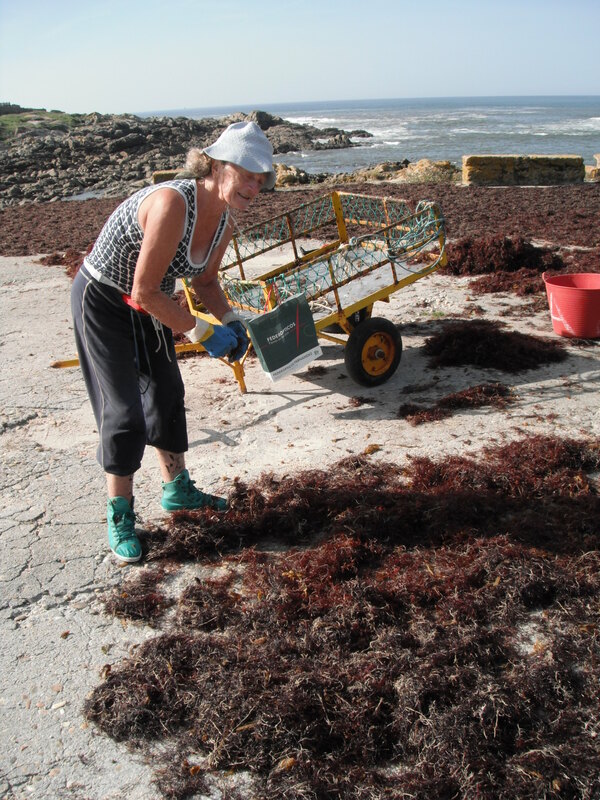 According to Marinalg.org, 200,000 tons of seaweed gets harvested globally every year and it is completely natural and safe to use. However, it does make me curious as to what else might be present in the food I eat. This entry was posted in Food, Spain and tagged carageenan, CEAMSA, European Nomad, Galicia, Porrino, seaweed, Spain on October 26, 2014 by A Nomad. Santa Trega – A Celtic Castro and Questionable Cuisine. 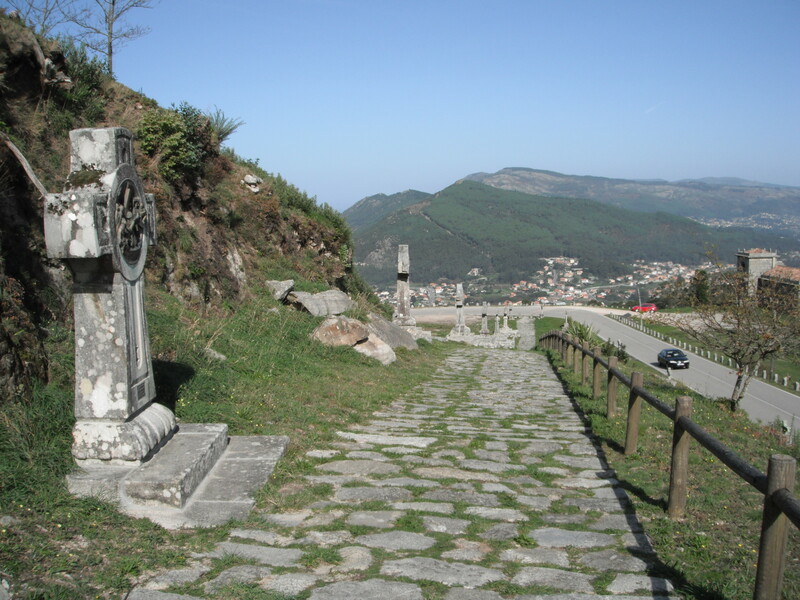 Standing guard over the port town of A Guarda is Monte Santa Trega, a 341m hill topped with phone masts. There’s a footpath from the town to the top and down to the beaches on the far side but, for €1, it’s far easier to drive along the road that snakes up the side. 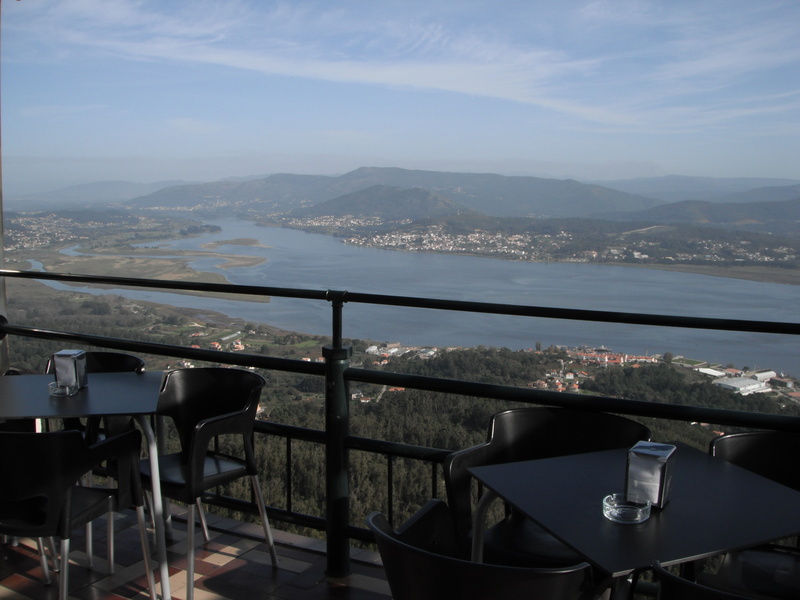 At the top are two restaurants, half a dozen small souvenir stalls and spectacular views south, across the river Mino to Portugal, and westwards, down to the town below. There is also a small, but extremely informative museum which provides a good introduction to the history of the Castro which is located on the hill. Although the display boards are in Spanish, I am given a very comprehensive and well translated ring-bound folder in English. The Castro was discovered and saved by a group of Spanish immigrants returning from Puerto Rico who decide to fund a road up the hill and the restoration of the holy places upon it. 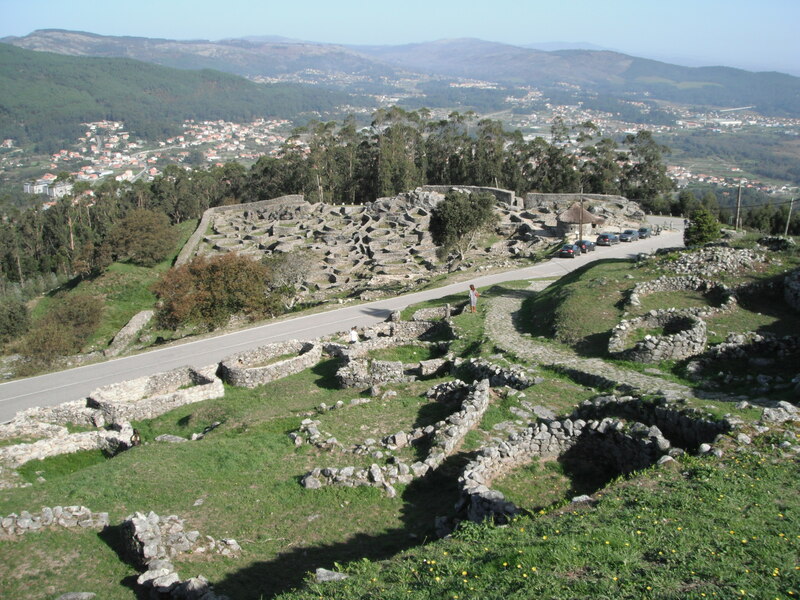 They found the Castro by accident but supported the archaeological excavations to uncover and examine the ancient Celtic settlement where 3000 to 5000 people could have lived. The northern area beside the road has been sympathetically restored while the southern sector lies in ruins, half hidden beneath the undergrowth. Many of the items found during the excavations are displayed in the museum, including a hoard of Roman coins, gold jewellery, hunting equipment and stones decorated on swastikas. Unfortunately, a unique bronze statue of Hercules was stolen and has never been seen since and is probably adorning the library of some wealthy private collector. As well as the Castro, there is a small chapel, a cool and peaceful respite from the hot midday sun and the gradually increasing number of visitors (up to 300,000 a year). 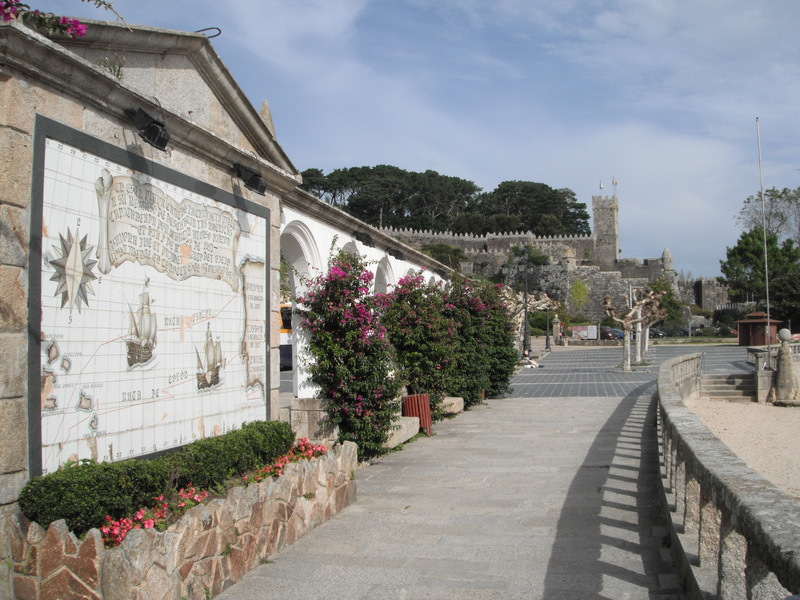 The Castro and the chapel are connected by a stone path marked by the ‘way of the cross’. The crosses are made from white granite with circular bronze reliefs depicting the suffering of Christ. After roaming around on the hill I’m feeling quite hungry. Although some people are having a drink in the restaurants, enjoying the panoramic views, no one seems to be eating. I decide to risk it anyway and have the €14 ‘menu del dia’ in the larger of the two establishments, which has small hotel attached. It looks as if it might easily cater for coachloads of pensionistas and tourists, but not today. I am the only client. The waiter seems quite excited to have someone to serve and the food, while nothing special, is filling local fare. Caldo gallego (cabbage, potato and bean soup), omelette, steak and chips. All served with water, wine and bread. However, it is the small details that let the place down. The food is served on cold plates; the only pepper is a powder which comes in a plastic container straight from the wholesaler; the mustard is well out of date and the only alternative the waiter can offer is tabasco sauce; dessert is an orange or a pot of plain yoghurt; and the toilets, whilst clean, have no toilet paper. This entry was posted in Food, Spain and tagged A Guarda, caldo gallago, castro, celtic, European Nomad, Galicia, Santa Trega, Spain on October 26, 2014 by A Nomad. What is a Parador? Well, quite simply, it is a state-run hotel in Spain, but Paradors are by no means simple. Many of them are former palaces, castles or monasteries. During the 1920s. Spain saw an opportunity to save many medieval and renaissance buildings by restoring them and creating modern, luxury accommodation for foreign tourists. Not all are historic though, a few are modern buildings designed by talented Spanish architects, such as the Parador Malaga Golf resort and the Parador Valle de Aran, a ski resort. 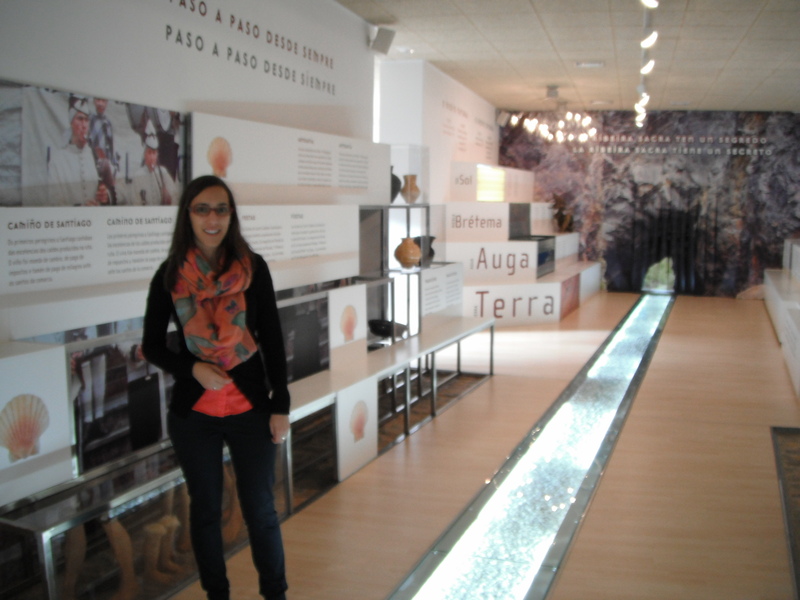 To date, there are about 90 Paradors in Spain and I have recently visited a few of them. 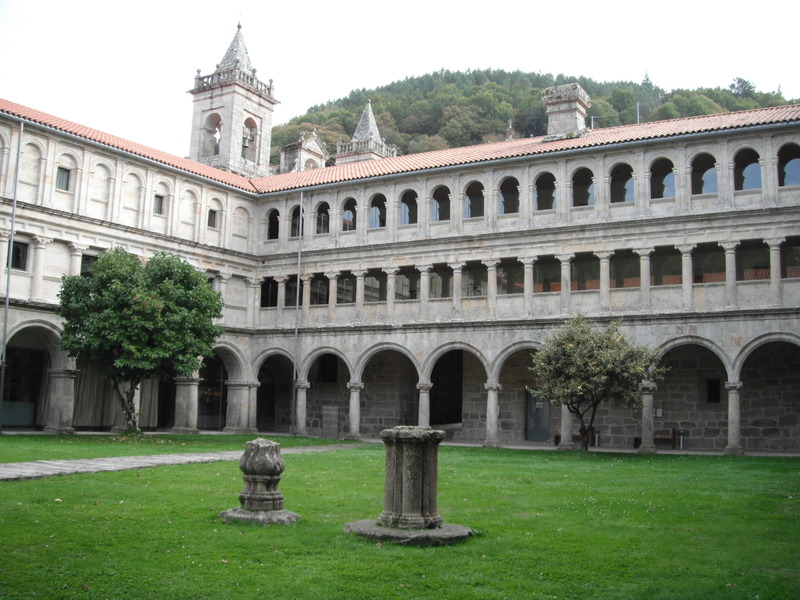 The Parador de Los Reyes Catolicos was originally a hospice for pilgrims to Santiago de Compostela. Built in 1486 by King Ferdinand and Queen Isabella, it overlooks the large Prazo do Obradoiro and the main entrance to the cathedral. Now it is a five-star hotel costing over €200 a night, but they still have a tradition of offering rooms for free to a few select pilgrims. I enquire at the reception about viewing the hotel and am told that a self-guided tour will cost €3 and I can only visit between 12 and 2pm. Instead, I ask where I can get a cup of coffee and am directed through the plush residents lounge to the bar, where I order and take a table outside in one of the 4 courtyards of the Parador. My coffee comes with two small buns dusted with icing sugar, an unexpected pleasure. I feel very decadent, sipping my coffee and studying the architecture of the former cloister. After, I am able to wander freely to another courtyard and past the chapel where staff are clearing away after some special breakfast event. It seems an odd place to eat! 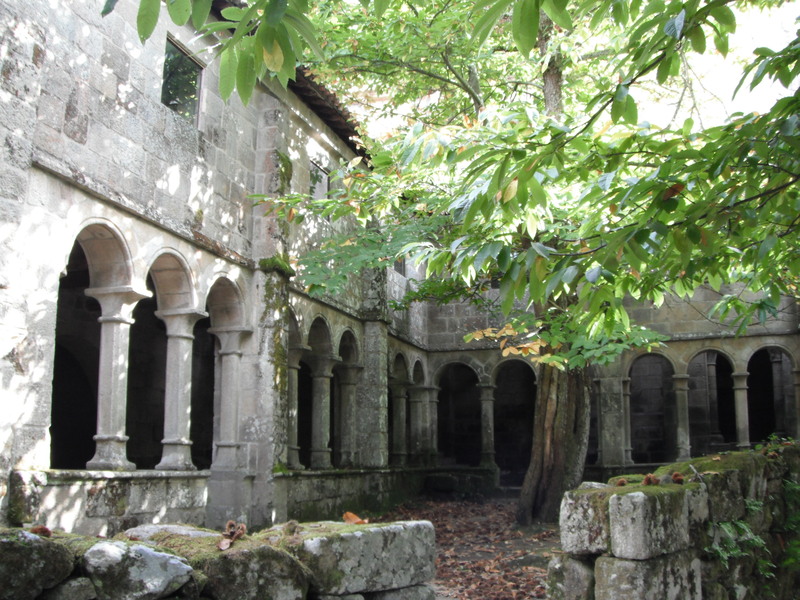 The next day, while driving through the Ribeira Sacre, I stop to visit another Parador, housed in the former Santo Estevo de Ribas de Sil Monastery. It dates from the 12th century and is surrounded by chestnut groves on the edge of the Sil canyon. The Benadictine monks left in 1836 during the seizures of Mendizábal but it has recently been restored and opened as a Parador in 2004. 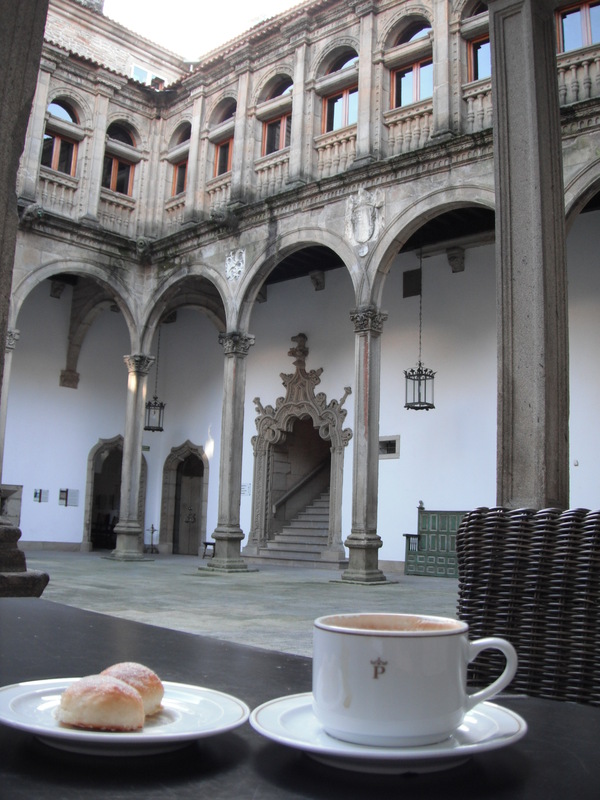 I order coffee, which comes with some tarta de Santiago, and sit overlooking the largest of the three cloisters. Here, they seem quite happy for visitors to wander around, providing information boards about the history and architecture of the building. 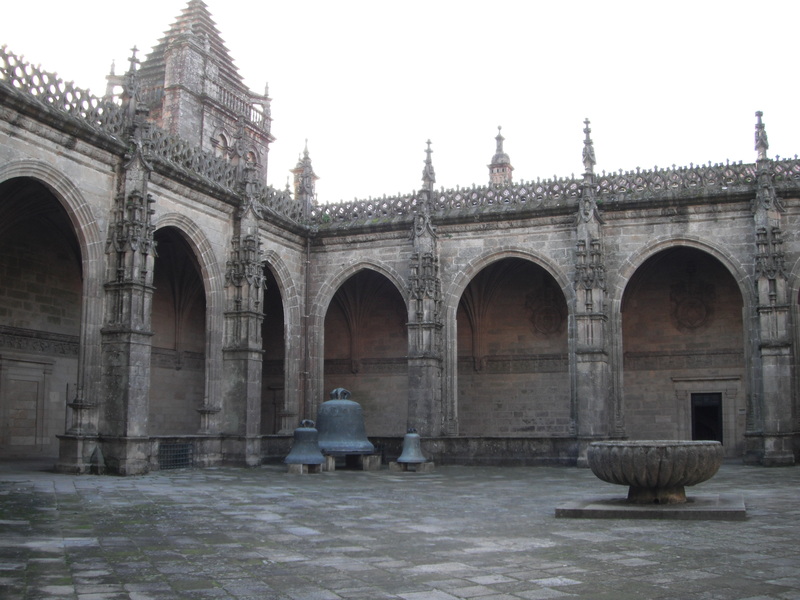 In the upper corridors of a smaller cloister is an exhibition of painting and sculptures by Florencio de Arboiro and the fabulous front entrance is adorned with a coat of arms representing the nine sanctified bishops who retired there. In contrast to the warm, welcoming Parador, the church is cold and uninviting, the only light shining through two modern stained-glass windows, high in the main apses. 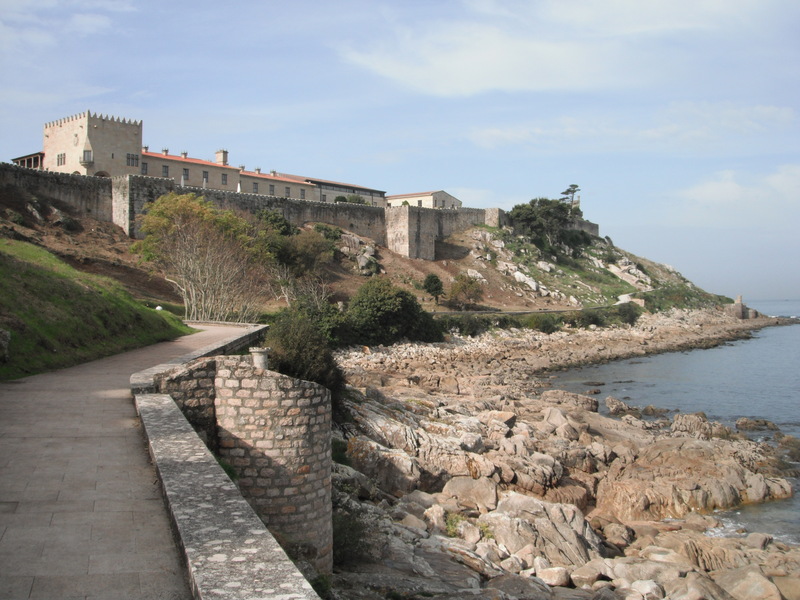 A few days later I arrive at the coastal town of Baiona. 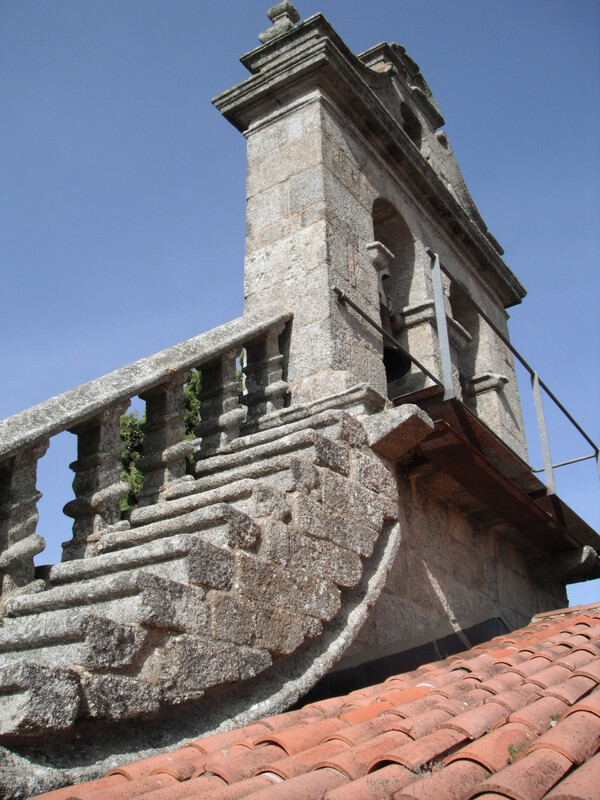 Hidden inside the high walls of the Monterreal Fort is another Parador – Conde de Gondomar. The tourist office is situated just outside the main gate to the fortress and they provide me with a small brochure detailing walks around the old town, as well as the 3km Monte Boi route which circles the peninsula where the fort sits. It’s a pleasant walk between the towering walls and the sea, but the Parador is as impregnable as the 14th century Franciscan Monastery and governor’s castle that used to stand there. The town itself has a colourful maritime history, not least as the first European port to receive news of the discovery of America. There are maps and monuments along the coastal route and a replica of the Pinta caravel is moored in the harbour. This entry was posted in Spain and tagged Baiona, Conde de Gondomar, European Nomad, Galicia, Los Reyes Catolicos, Monte Boi, Monterreal, Parador, Ribeira Sacre, Santiago de Compostela, Santo Estevo, Sil canyon, Spain on October 25, 2014 by A Nomad. 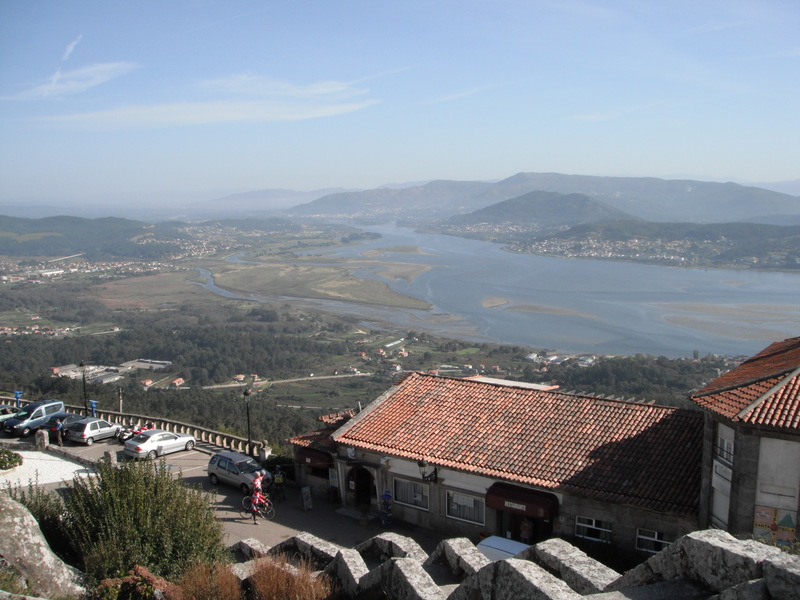 Tucked away in the south east corner of Galicia is the Ribeira Sacre, which translates as the sacred riverbanks. It’s a region rich in religious buildings and vertiginous vistas where heroic viticulture takes place on the steep southern slopes, in order to produce a unique selection of wines. 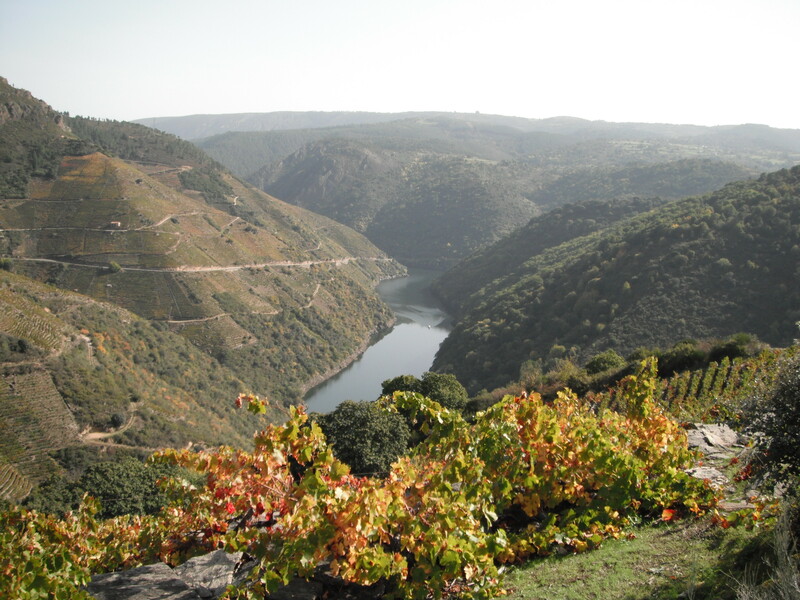 The grapes are nurtured by the warmth of the sun and the humidity produced by the rivers. Although today the sun is blocked completely by the thick low lying mist in the valleys. While I’m waiting for it to clear, I decide to learn about the local wine by visiting the Wine Interpretation Centre in Monforte de Lemos. Enthusiastic Beatrice gives me a private English language tour of the Centre which is an exposition based on the five senses. Clearly the designer was very artistic given the way the information is presented, including a river of wine bottles and a wall of photographs representing local culture. The tour finishes in the wine shop where I get to sample one of the local red wines. It’s a blind tasting and could even be the same wine which was chosen by President Obama to celebrate Hispanic Heritage Month last year. As the sun begins to burn through the mist, I head south to the Sil River. Passing over the hills to start my descent into the valley, I am greeted by the most spectacular view of the river where a pleasure boat is cruising far below. The terraced slopes are filled with lines of vines whose leaves are starting to turn to autumn colours. The harvesting of the grapes has already been completed and the wine is now fermenting in the nearby bodegas. On the opposite side of the canyon, I can see my next stop, the village of Castro Caldelas, with its castle keep and church bell tower. After lunch, I explore the village. The castle is closed but the surrounding old village streets are interesting and when I reach the church, in the cemetery at the edge of the cliff, I discover a narrow flight of steps leading up to the bell tower. The view from the top is magnificent but I nervously check my watch for fear of being deafened by the bells. The afternoon finds me winding my way through the forested southern slopes of the canyon. A detour down the side allows me to visit the Santa Cristina Monastery, long abandoned and now only a ruin. Apart from a few local men collecting chestnuts, I have the place to myself. The empty rooms are dark and damp. There’s no view, only endless oaks and chestnut trees. It’s not a place to linger and another monastery beckons. 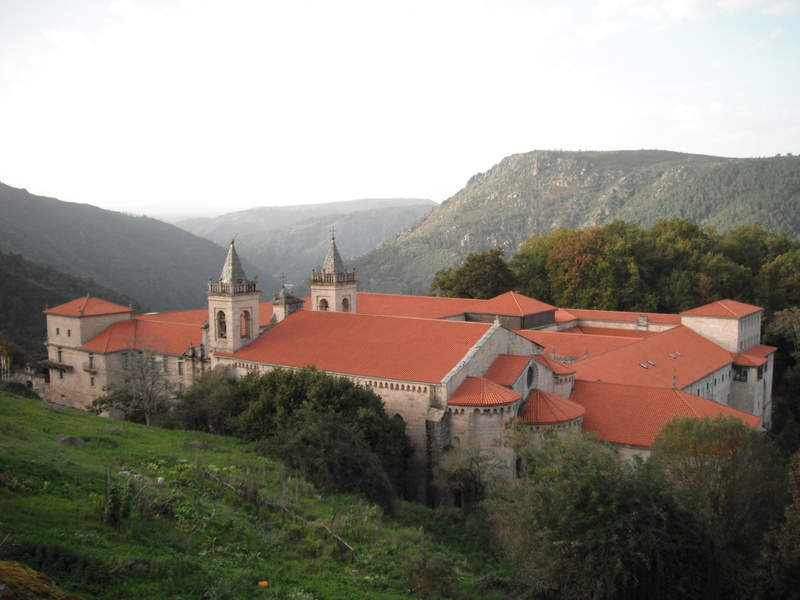 The Santo Estevo de Ribas de Sil Monastery was built in the 12th century but eventually fell into ruin until it was recently restored as a luxurious Parador. It’s a huge complex of 3 cloisters, each representing a different architectural era (Romanesque, Gothic and Renaissance), 4 wings and the large Romanesque church. Finally, I reach the point where the River Sil merges with the River Mino. What I find there is a huge hydroelectric plant and a dam, which I have to drive across to reach the town of Os Peares. Hydro power is not the only renewable energy source in the region. The hills along the Mino valley are dotted with huge wind turbines. This region is green in more than one sense and, given the lack of good information about the region, it is a rare, undiscovered gem. 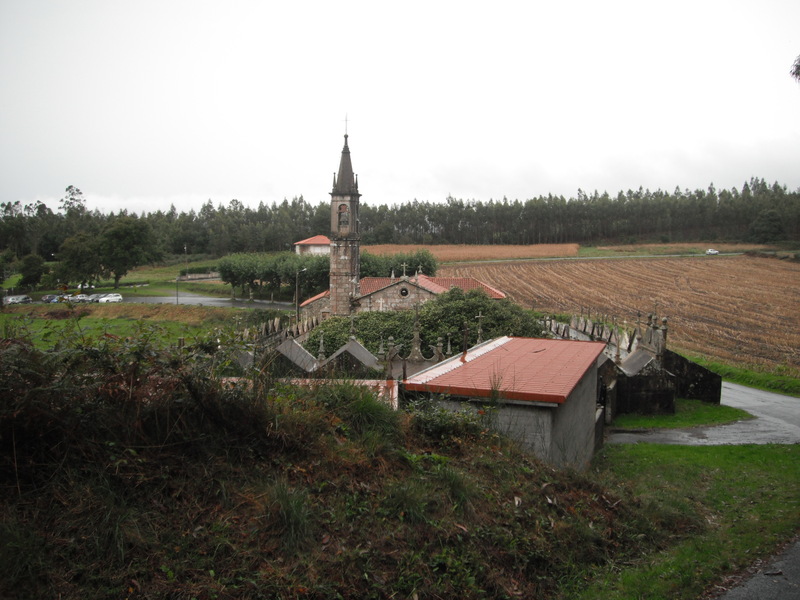 This entry was posted in Religion, Spain, Wine and tagged Castro Caldelas, European Nomad, Galicia, Mino, Monastery, Monforte de Lomas, Os Peares, Parador, Ribeira de Sil, Ribeira Sacre, Santa Cristina, Santo Estavo, Sil, Spain on October 23, 2014 by A Nomad. In the Middle Ages, half a million pilgrims travelled to Santiago de Compostela, Galicia, Spain. Now about 200,000 people walk, ride or cycle the Camino de Santiago each year, not only one but many routes, which end in the city. Many people are true devout Catholics who walk the route as penance for some sin, or in search of an answer to their prayers, a solution to their problems or a miracle cure for an illness. Of course, some are just tourists lured by the promise of stunning scenery, romantic Romanesque churches and great Galician gastronomy. Pilgrims have been walking to Santiago de Compostela ever since the remains of the apostle James were found by a hermit called Pelayo in 814 AD. Although James was martyred in Palestine around 45 AD, it is said that angels guided his body to Galicia in a stone boat which landed at Padron, 21km from Santiago. All rather convenient for the Catholic church of Spain, during the dawn of the Reconquista against the Muslim Moors. In 1589, when Drake attacked the Galician coast, the sacred bones were hidden away, so well in fact that they remained lost until 1879 when a cathedral workman stumbled across them – another miracle! 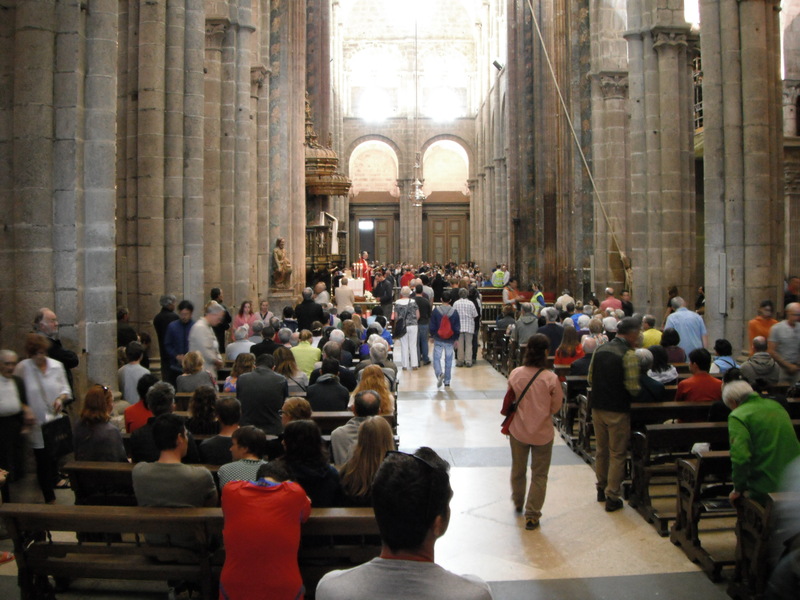 The building of the cathedral was paid for from annual taxes imposed on the people of Spain by Ramiro I of Asturias after St James assisted in the defeat of the Moors during the battle of Clavijo in 844. The original 9th century basilica was superseded by the 11th – 13th century cathedral and an 18th century Baroque façade which hides the delicately sculptured Portico de Gloria by architect Maestro Matteo. However, today’s pilgrims are welcomed only by the site of two huge scaffold towers which block the main entrance – what a disappointment! Inside awaits a grand, silver-clad high altar, also partially obscured by scaffolding. A 12th century statue of St James adorns it and pilgrims queue to climb the stairway, kiss the statue’s robe and receive a holy card (proof of their pilgrimage). In the crypt below, St James’ remains are kept in a shiny silver reliquary behind a locked grate for safe keeping. I attend the pilgrim’s mass at midday, where a mixture of pious elderly Spaniards, youthful multicultural backpackers and inappropriately-dressed American tourists repeatedly stand and sit, and stand and sit for the hymns, prayers and sermons given by red-cloaked Catholic priests and a harmonious nun. There must be over 400 people in attendance and the collection bag looks very weighty indeed. No need for a tax when the daily donations are so forthcoming. The botafumeiro hangs limply above the altar. Today it will not swing wildly in great arcs along the transept, dowsing devotees with perfumed incense. This spectacle only occurs on Friday at 7.30pm,or when someone privately pays the €350 for the honour. I pay €6 for the privilege of visiting the cathedral museum. It allows me access to the large cloister and several floors of exhibits, including the library filled with ancient encyclopaedias and religious manuscripts, such as a 12th century illuminated Codex Calixtinus, the world’s first travel guide about the pilgrimage route. There are also some interesting tapestries by Rubens and Goya on the top floor, along with a lengthy stone balcony which overlooks the Prazo do Obradoiro (square of works), the 18th century Pazo de Rajoy (now the town hall), the Colegio de San Jeronimo and the 16th Century Hospital Real (originally a hospice for sick pilgrims but now a five star Parador). 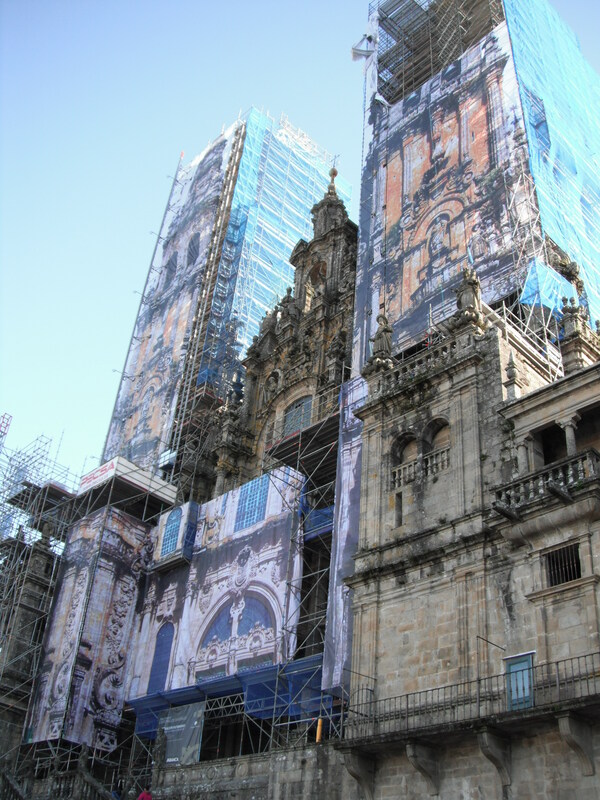 My visit to Santiago de Compostela feels fraudulent. Although I have passed along much of the Camino on my travels: St Jean-Pied-de-Port, Roncevalles, Pamplona, Burgos (The French Route); San Sebastian, Bilbao, Santillana del Mar (The Northern Route); A Coruna (The Maritime Route), I have not walked “The Way”. And I don’t think watching the 2010 film by Emilio Estevez counts either. However, Santiago de Compostela is an interesting city to visit, with a spiritual and friendly vibe due to all the devotees passing through. I leave with a feeling that my soul has been nourished, and with a small tarta de Santiago to nourish my body. 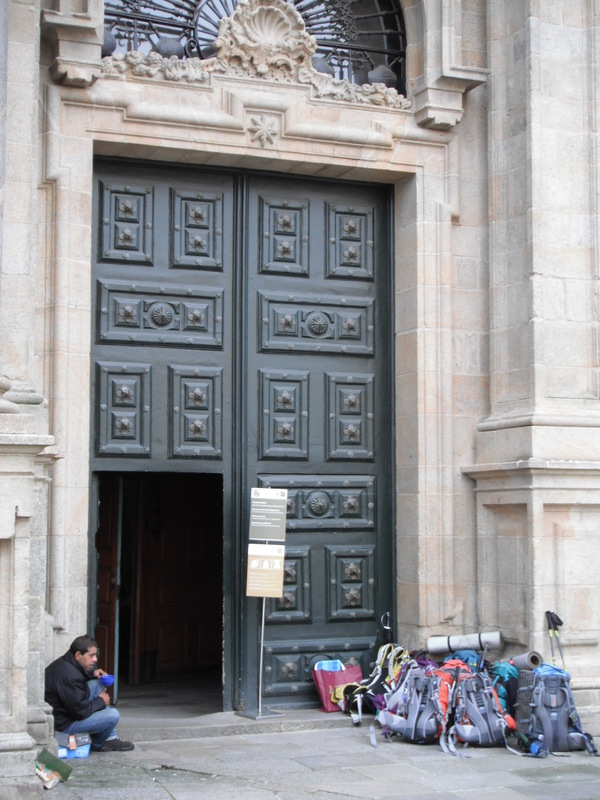 This entry was posted in Religion, Spain and tagged botafumeiro, Camino de Santiago, Codex Calixtinus, European Nomad, Galicia, Parador, pilgrim, Prazo do Obtadoiro, Santiago de Comostela, Spain, St Jame, The Way on October 23, 2014 by A Nomad. I have driven to the furthest point west on the Spanish coast, or so most people believe. Actually, Cabo Tourinan, 20km further north, claims that record. Along the way, I see several walkers with large backpacks, wooden walking sticks and plastic capes shielding them and their belongings from the unpleasant weather. 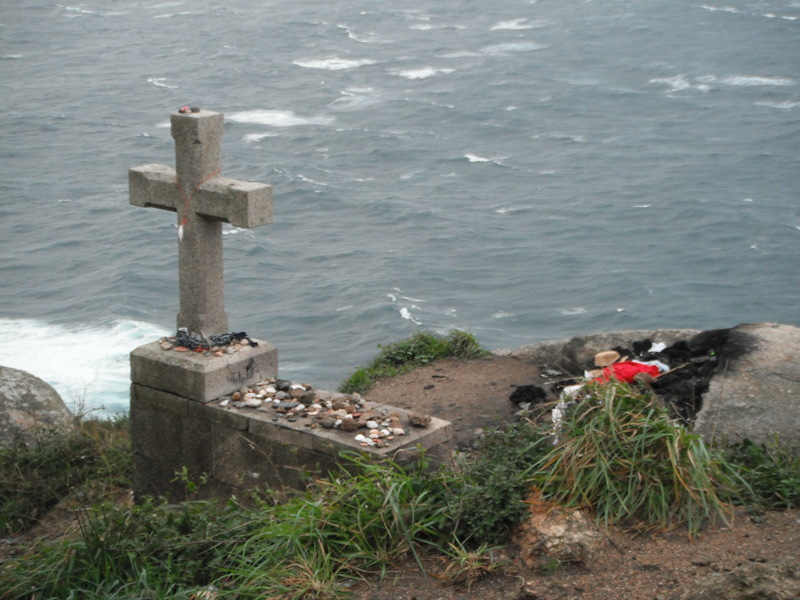 For most pilgrims, their Camino finishes at Santiago de Compostela, but many continue on to the coast and Cabo Finisterre (The World’s End). I feel like a fraud, driving up in my motorhome, and I respectfully watch as a small, bald, bespectacled man takes selfies in front of the ancient 15th century stone cross. He calls me over and asks if I can take a photo for him. I’m happy to oblige and congratulate him on the successful completion of his journey. 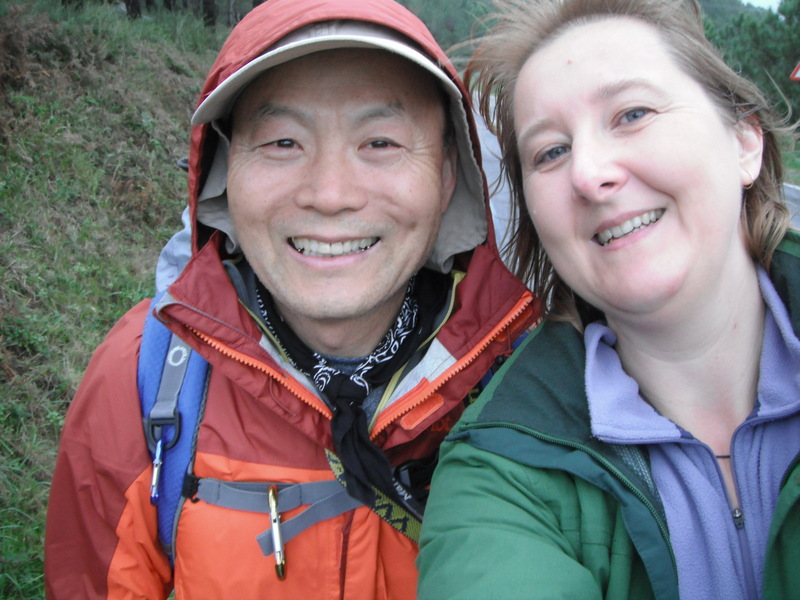 Amazingly, I discover that Jin (an American Korean) has walked from St Jean-Pied-de-Port to Santiago de Compostela in only 34 days, a journey that takes most people at least 6 weeks. 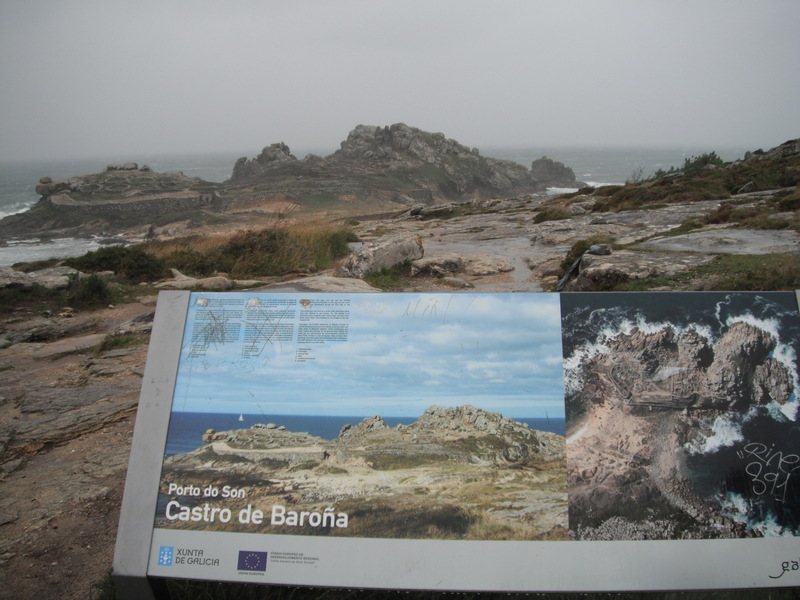 Although he freely admits to catching the bus from Santiago to Finisterre on account of the bad weather. We walk separately past the bar, the Parador and down to the lighthouse and simple symbolic concrete cross beyond. There is a large pile of ashes near the cross where pilgrims have burnt the clothes they wore during their trek. Other mementoes lie scattered around it: a lonely boot atop a rock, a fluorescent green compass and piles of scallop shells, the symbol of the Camino de Santiago. I offer Jin a lift back to town but he declines, preferring to walk. I respect and admire his stamina, right to the very end. We take a selfie together and go our separate ways. 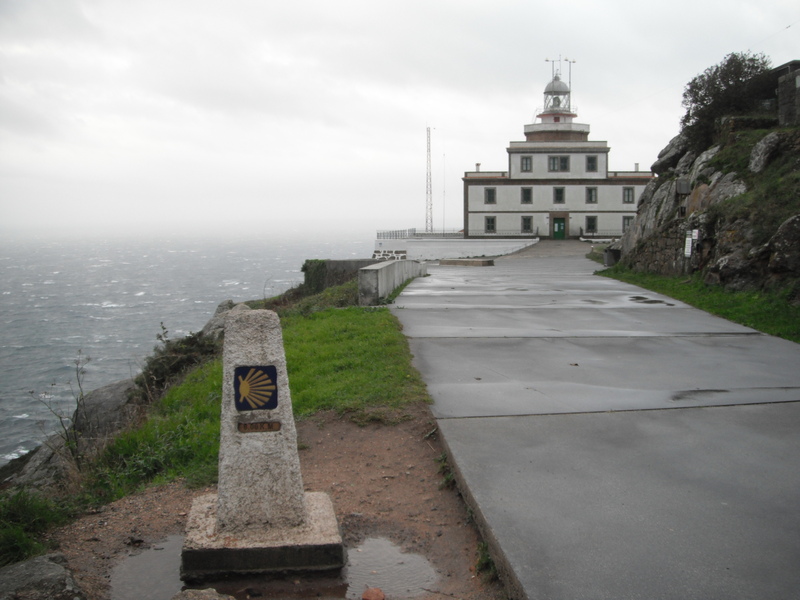 This entry was posted in People, Religion, Spain and tagged Cabo Finisterre, Camino de Santiago, costa de morte, European Nomad, lighthouse, Santiago de Compostela, Spain, St Jean Pied de Port on October 18, 2014 by A Nomad. There are many reasons that the Galician coastline between A Coruna and Muros is named for the dead. 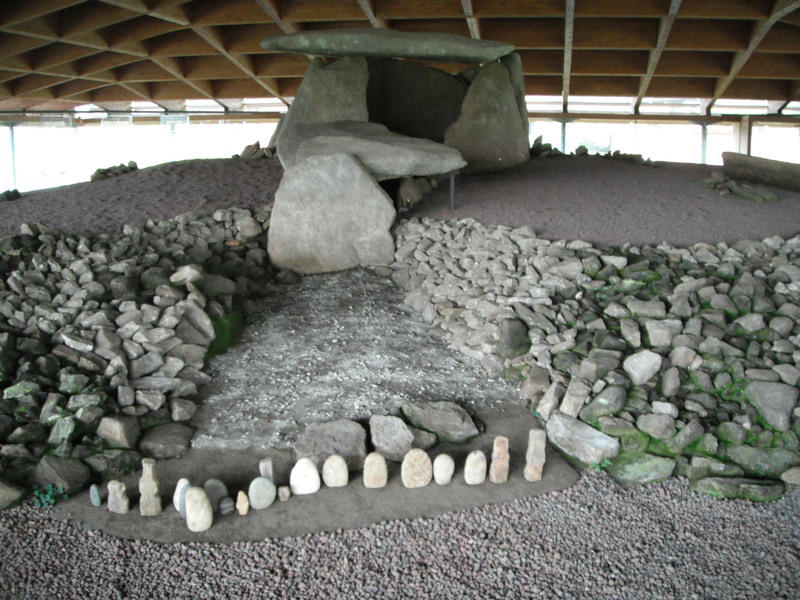 For a start, it is dotted with dolmens, ancient burial chambers, dating from almost 6000 years ago. Between Baio and Serramo there is a signposted “ruta de dolmens” and I start with the most well preserved specimen in the area, the Dolmen Dombate. It is housed in a glass-walled visitor centre which, according to the signs, is only open from Friday to Sunday. It is Thursday but the security guard seems happy for me to go inside and have a look, reminding me not to use the flash on my camera. The dolmen is unimpressive compared to the Tables des Marchands in Brittany and looks slightly fake. It can only be viewed from a distance, which is most disappointing as I had read that the interior has an engraving of a ship. I contemplate asking the guard if I can have a sneeky peek but he seems keen to leave and have his lunch. I try to find the Pedra Cuberta, a dolmen with a 6m long chamber, but the “ruta de dolmens” follows narrow farm roads with no place to park a car, let alone a motorhome! 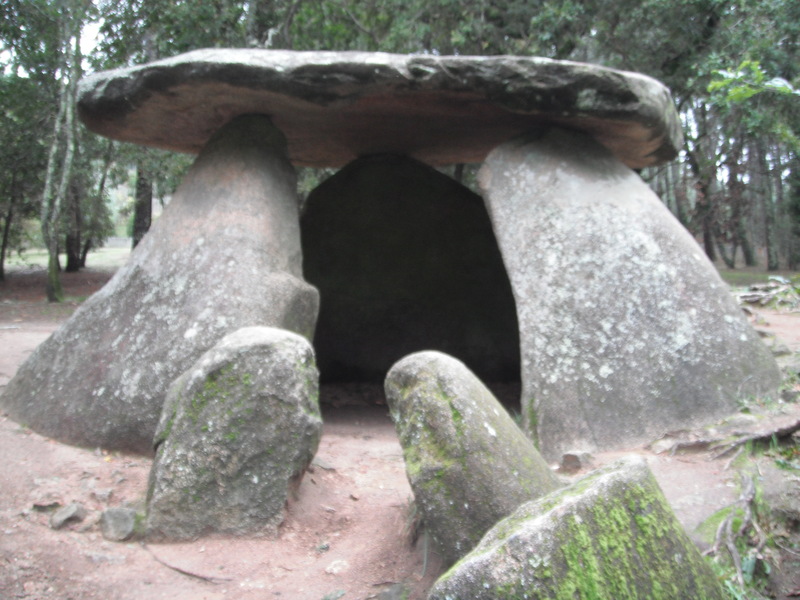 The next day brings me to the Axeitos Dolmen, which is situated in a park not far from the village of Olveira. The site is deserted and I approach the dolmen along a path lined with oak and pine trees. The wind is strong, causing me to be bombed with acorns and pine cones. It’s possible to get up close and personal with this example, I can even venture inside. If there were any carvings they have long been eroded by the elements and covered with green lichen. Earlier, I had come across a petroglyph, hidden behind a supermarket. At first it just looked like a pile of rocks, covered in leaves and lichen, but then I saw it, the faint outline of a circular pattern, and I was excited. 2000 years later, Iron Age fortified settlements were built along the coast. I discover the ruins of the Barona Castro in the most spectacular setting, on a promontory jutting into the sea below the Barbanza Mountains. The signed footpath takes me through a pine forest and then out onto the granite slabs which form a treacherous road down to the settlement. However, as I leave the shelter of the forest, I am most literally blown away by the stormy winds. The rain stings my face and the ruins are almost obscured by the sea spray. I might be British and therefore used to such inclement weather, but I’m not suicidal. I opt to view the site from a safe distance. Besides, it has apparently been “touched up” for the tourists and reconstructed to better simulate the original features. During the Middle Ages, fortresses and defences were built at some of the inland towns and villages. Mens has a fine example of an ivy-clad castle with a tiny Romanesque chapel, supposedly linked by an underground tunnel, and at Vimianzo, a 16th century castle has been turned into an art gallery and exhibition space for traditional crafts. Others have been transformed into expensive, luxury Paradors. It’s not hard to forget the dead in these parts. There are many 12th century churches and stone crosses, as well as the modern-day cemeteries. Even the 18th century horreos (granaries) are adorned with crosses. The coastal rocks have caused many shipwrecks over the years from Armada warships, fishing trawlers and large tankers. Also, many people have drowned while swimming in the treacherous waters. The 19th century Napoleonic Wars bought foreign soldiers to the region and battles resulted in many casualties, including Scottish General John Moore, who was killed by a cannonball during the battle of Elvina on 14th January 1809. He is remembered by a memorial in the San Carlos gardens in A Coruna. Finally, the 21st century brought an environmental threat to the coast and death to much of the marine and bird life as well as major disruption to the fishing industry, the main economic lifeline of the region. On the 19th November 2002, the “Prestige”, a Greek oil tanker, broke up off the Spanish coast and spilt 63,000 tons of oil. 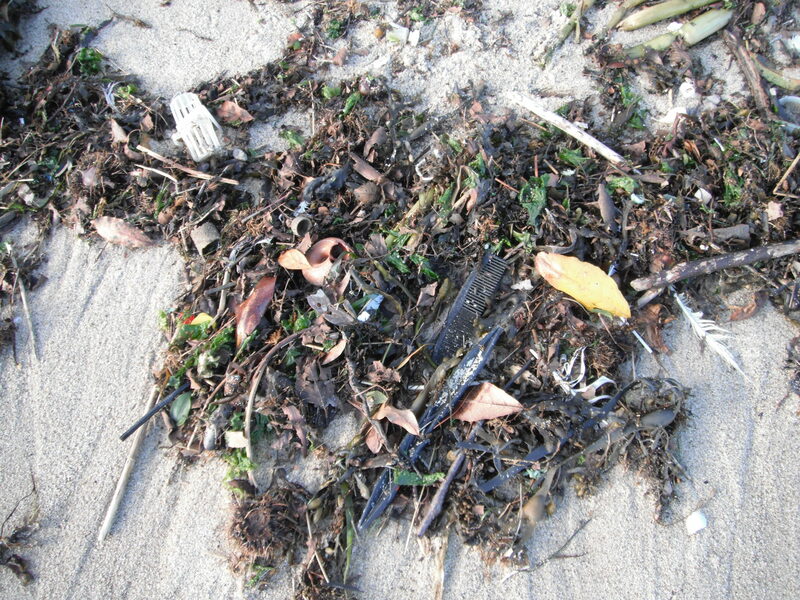 Even today we fill the seas with rubbish that won’t decompose. A short walk along the beach at Boiro found it littered with plastic disposable lighters, shoes, a comb, plastic bottles, bottle tops and a dead seagull, all washed up after the recent storm. This entry was posted in Spain and tagged A Coruna, Axeitos dolmen, Barona, Boiro, castro, costa de morte, dolmen, dolmen Dombate, European Nomad, horreos, John Moore, oil spill, petroglyph, prestige on October 18, 2014 by A Nomad.